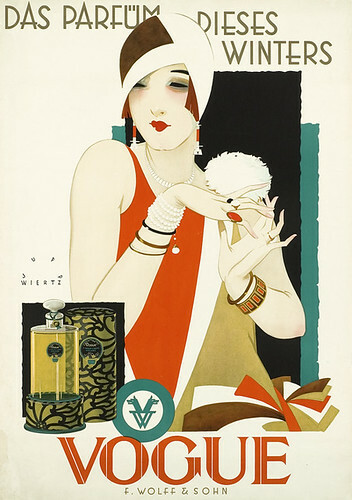 The perfume of this winter - Vogue (1927), originally uploaded by Susanlenox. Bautiful! I love your blog. i recently treated myself to a copy of Vogue from 1927, the year my grandmother marrried. She was quite the flapper, and i remember sitting with her thumbing through her University of Texas Sorrority annual with all the pictures of the girls in those unbelievably elegant flapper gowns. That book got lost along the way; I would rather we had lost something less valuable, like maybe some diamonds or a silver coffee service. Looking through that old Vogue with my mother was a real treat. In the 1920s, Vogue actually printed articles on how to dress fashionably on a budget! Thank you for sharing this lovely ad and kindling some memories of the women who have been important in my life. Love your blog(s). I too am moved by the changing tides of the years before I was born (1963), i adore art nouveau, I'm all a dither for Art Deco, and i'm mad for Art Moderne. Shall we lift a glass to good design, whatever form it takes? And if I may, could we wish my grandmother and her fllapper friends a jazzy rest. Hi flappers, cheers! And thank you for your comment Roze, shared memories like that, that stay with you throughout the years, are the best. Such a beautiful image and the quality is amazing. Where do you find all those wonderful pictures? I love your blog and hope to see much more of it. Thank you.